With the advent of the rainy season, and the impending threat of the Zika virus (ZikV), the Vector Control Division – Ministry of Health has begun its preparation to minimize the impact of any mosquito borne diseases that may become a threat to the well being of our citizen’s health and wellness, important industries such as tourism and our economy. The unit has begun to increase momentum in its routine Entomological Surveillance throughout the island. These include but are not limited to the issuance of abatement notices to offenders of the Mosquito Destruction Act which is one of the strategies used to get householders compliant and obligated in the prevention and control efforts. Swamplands and other wetlands are carefully examined and treated with BTI where possible or larvivorous fishes being introduced, Fogging would complement those measures. These measures are to reduce the breeding of the Aedes Aegypti mosquito, which is said to be the vector responsible for the spread of the Chikungunya, Dengue, Yellow Fever and the Zika virus (ZikV). 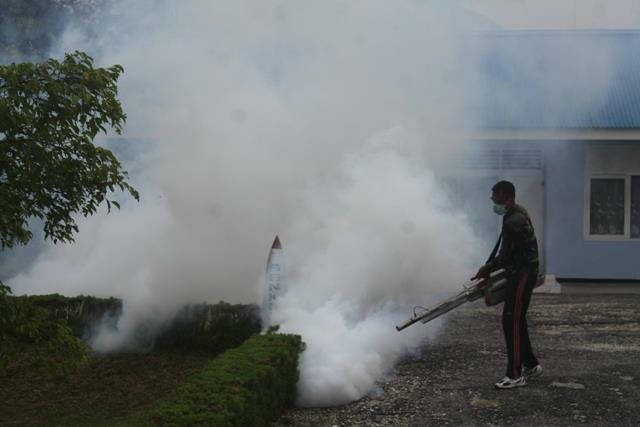 Meanwhile, although fogging is considered a secondary option in reducing the mosquito population, health officials say the number one priority of individuals should and must be keeping their surroundings clean and reducing breeding sites such as old tires, tins, coconut shells, blocked drains and other water holding containers. However, the Ministry of Health continues monitor and will do all it can by exerting all efforts to control and minimize the spread of the Zika virus and any other vector-borne diseases. A special appeal is also being made for persons with respiratory difficulties to stay away from the fog or inform the fogging team of their health conditions. The fogging teams are also seeking the support of Aviary farmers and Bee keepers to avoid possible disruption in the exercise. The Vector Control Division can be reached on telephone number 440-2095.